I love, LOVE this program. I had some soreness, but not as much as the last time I did two-a-days because I have more recovery time now. I had to eat more to maintain my weight. I’m currently at 150. I’ve gained about 15 pounds since the show in August. I’m hoping there are a couple pounds of muscle in there. I was emotionally ready to start my cut a couple weeks ago. This workout switch up is helping me deal with the sense of urgency about NOT cutting for a couple more weeks. It’s really not that big of a deal. If 20 weeks is a long enough cut this year (I did 24 weeks last year), then I’m good. If it’s not long enough, I’ll pass on the June show and do one in July. No biggie. It was important for me to hit the first target last August because I would not let the trainer drama derail me there were other issues involved. Now, my support structure is solid, I’m surrounded by people I trust, so it’s all good. 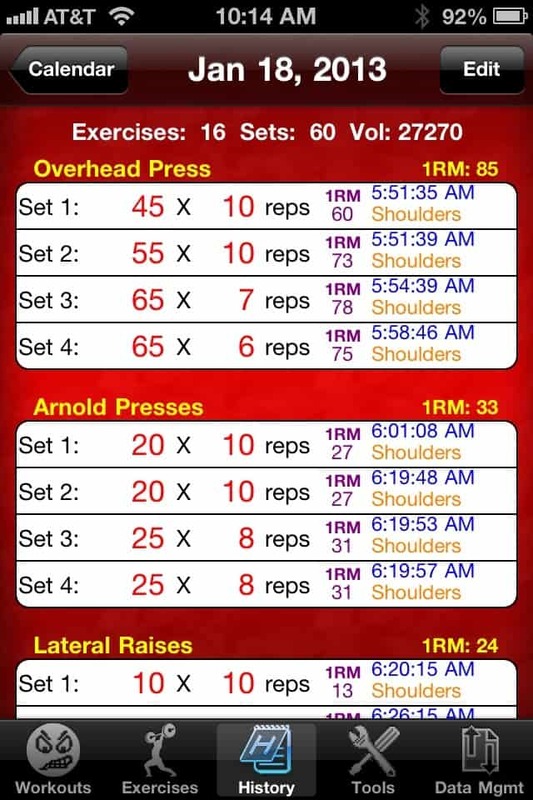 Here is my shoulder/leg workouts from Friday off the Gym Buddy app. I did too much. It was the last day of finals and I didn’t have to be at work until 7:30, so I added extra shoulder sets in the morning. For legs, the pulled hip wasn’t hurting as much as it has for the last couple months, so I was testing it by adding more weight. 3 sets turned into 5 sets. And I didn’t cry on split squats like I have been for the last two leg workouts. Single leg press was a little scary, though. The right leg was just not stable. Overall, I’m not pleased about my weights not increasing very much. I suspect I’m afraid to push myself since I’ve had two injuries now. Maybe I need a training partner? I hate the idea of organizing my program around another person though. I like working out alone. So I keep the weights manageable, work on strict form, and do more reps and sets. I keep reminding myself to remove my ego from the lifts. If I’m growing, that’s all that matters. PRs are just so much fun! I hit one for DB bicep curls this week. That was cool. However, I suspect I my approach towards delts is all wrong. I need to chat with D about it. I have a couple ideas, which he’ll probably hate, so I’ll wait and tell you when there is a plan. Since the hip seems to be stronger, I’ll add deadlifts to my back workout this week. If I stretch a lot today and drink a lot of water, the legs should be recovered enough tomorrow to handle it. If not, I’ll flip the back and chest workouts this week. Thanks, helpful. Starting tomorrow morning, wish me luck. Good luck! Oh please don’t tell me you are going to do THIS workout! I shouldn’t have done this workout. LOL! How do your legs feel for leg day after doing stairs 2 of the previous three days? I’m always afraid of doing too much stair work in fear of having dead legs for my lifting days. Didn’t notice it. They were only 21 min HIITs and I put the leg workout to be on Friday afternoon when the last HIIT was on Thursday morning. But there was no way I was going to do anything of high intensity on Saturday. Or today. Oh I love HIIT! Just never done it with stairs. I am definitly with you on the taining alone part. I had one workout partner a few years back, and we were good friends, worked together, and were on the same wave length. Haven’t found another workout partner since. Working out alone does have its advantages though. Scheduling is easier, and sometimes a partner can sugar coat things, which can cover up weaknesses or just plain laziness- misery loves company. Marie Callenders does make some good food though- good choice. 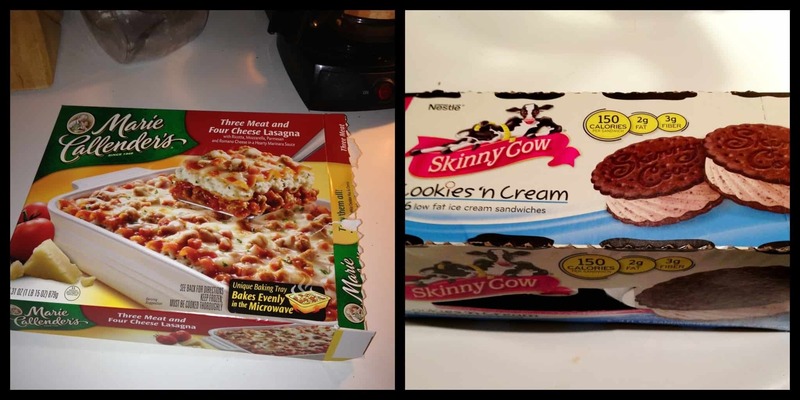 I love that lasagna! Perfect size for two people to not over eat. Perfect size for me when I want to over eat, but not die. No left overs.